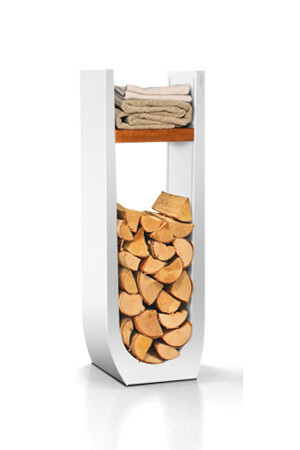 The beautifully designed SYLI wood rack is both functional and elegant – the firewood is stacked up in a neat pile and conveniently dries up to be used. The beautifully designed SYLI wood rack is both functional and elegant – the firewood is stacked up in a neat pile and conveniently dries up to be used. Once the logs are dry, they are easier to light up, burn with better efficiency and provide more thermal energy. Furthermore, the level of fine particles in the emissions produced by burning dry wood is significantly smaller than burning an equal amount of wet wood. SYLI is open on both ends and holds logs of all sizes. On the front side of the wood rack, the ends of the logs can be evened up or left naturally uneven. All the debris is left in the rack and can be vacuumed or washed away easily. SYLI is made of steel and it is an elegant interior element that withstands heavy use. The firm wood rack stands up right even in the hustle and bustle of the most active families. The color options of glossy white and calm black offer an option for all fireplaces. The rack has ten levels to place shelves – one shelf is included.